The design of the unit-to-process connection is key to optimizing the capability of the heating/cooling system. Selecting proper pipe ID’s, minimum run lengths, minimum elbows, tees, etc. are all important to creating a low pressure drop... thus a high flow rate... installation. 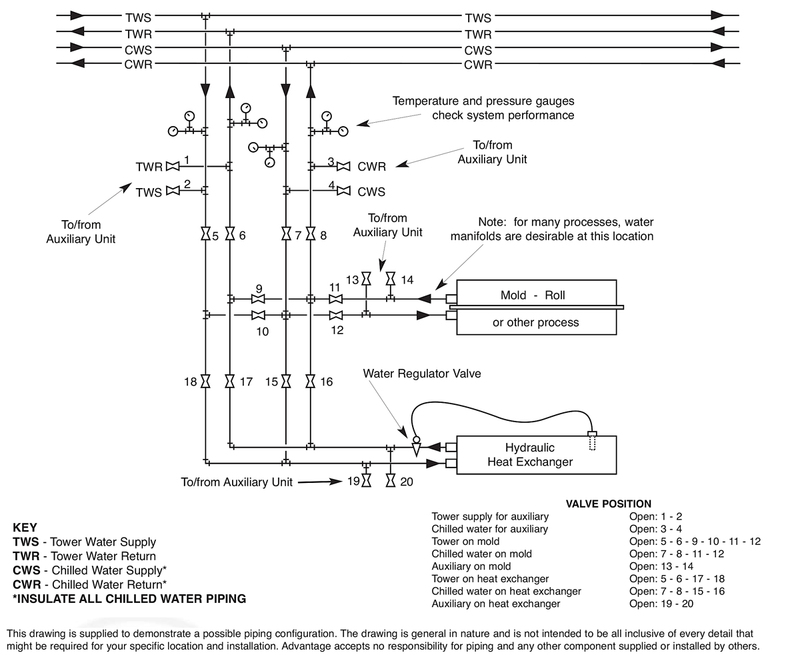 This diagram schematically contains piping and valving details which may not be needed in all cases. However, for molding installations requiring maximum flexibility, a relatively minor increase in original piping costs can have great efficiency paybacks in the future. Select pipe sizes for 5-7 feet per second flow velocity and 5-10 psi pressure drop. Consult the engineering department for assistance when needed. Would you like to Download FYI #010 to your browser?